The imaginative Gambado was easy to overlook in its first edition debut, at least for a child easily distracted at the time by slimier, more tentacled designs. 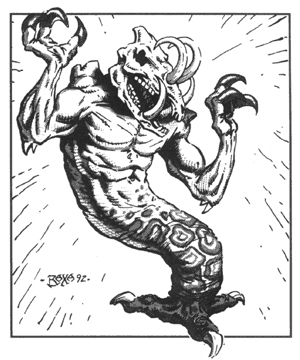 The original illustration looked more like a ghost someone forgot to finish drawing, and was one of the last creatures in my Fiend Folio that I finally stopped to read about. I was pleasantly surprised to discover just how bizarre it was. Far better illustrated the second time around, the Gambado isn't a spirit or specter at all, but a skull-headed carnivore whose body terminates in a muscular, contractile trunk, capable of launching it like a gigantic, organic spring. Burying itself up to the neck in sand or soil, the monster looks like the innocuous, bleached cranium of something long dead, and just when you least expect it...BOING! You're dead! Dead with a "boing." Now who's laughing, jerk? The DiTerlizzi Monstrous Compendium depiction doesn't stray very far from the previous, but I love the thinner, bonier, extremely long arms and the more expressionless skull, which actually isn't a physical part of these creatures at all; like hermit crabs and snail shells, Gambado wear the skulls of other creatures and puppet them with specialized muscles. 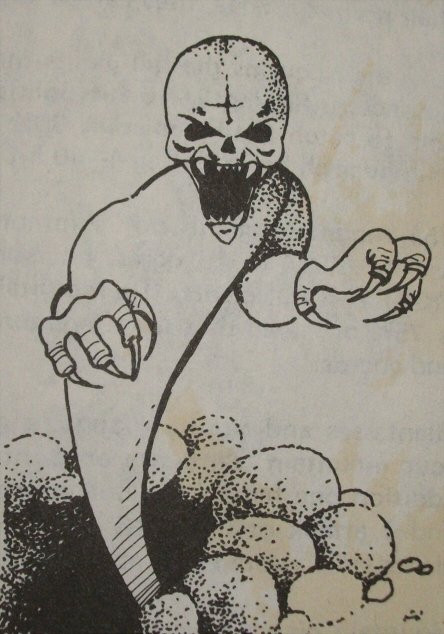 What they actually look like underneath is left to our imaginations, but I never thought this drawing left room for much more than a creepy, gaping neck hole and some pulsing, meaty flaps. I wonder what they do if they can't find a large enough skull? Could they wear the skeleton of an entire smaller animal for a head? I loved the Gambado so much when I was younger that I tried to incorporate it into one of my earliest fantasy settings, before I even had the internet to share my more original ideas with. 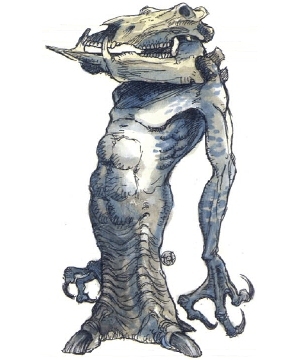 While D&D's Gambado were of animal intellect and usually solitary, I imaged them with their own primitive skull-based civilization, collecting skulls of various shapes and sizes that they would swap out for a variety of daily tasks, worshiping skull-gods and rattling off a complex language of clicking, clattering jaws and teeth.